Caroline Hepker | Bloomberg Media Talent | Bloomberg L.P.
Caroline Hepker anchors Bloomberg Radio’s “Daybreak Europe.” She launched the program in 2015 with a new team in London who have now taken it onto London DAB digital radio in the UK. 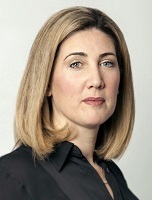 Caroline Hepker anchors Bloomberg Radio’s “Daybreak Europe” program, on-air live from 6-10am weekday mornings. Caroline launched the program in 2015 with a new team in London who have now taken the program onto London DAB digital radio in the UK. Prior to joining Bloomberg in 2015, Caroline spent 15 years at the British Broadcasting Corporation as a Business Presenter and Reporter for BBC TV, radio and online. Caroline presented business news programs on the BBC Newschannel & BBC World News in London and spent 7 years based in New York as the BBC’s US Business & Economics Reporter. Caroline also anchored the BBC’s flagship business radio program “Wake Up to Money” on BBC Radio 5 Live and worked as a general news reporter for BBC London News on BBC1. In the US, Caroline covered the 2008 financial crisis, the bail-out of US auto-makers, financial markets on the floor of the NYSE and institutions including the IMF and World Bank. Caroline spent much of her time travelling across North America reporting on business and economics for the BBC’s global and UK audience. Caroline Hepker is a graduate of the University of Bristol and is based in London.